Beautiful materials, clever furniture, canny room layout and cosy atmosphere: Our rooms offer so much more than just a roof over your head! En-suite bahtroom with shower and toilet. Lots of space for your beauty products. Our guesthouse is just opposite the church St.Jakob. The historic bells are ringing daily from 7am until mitnight. These rooms offer lots of daylight and space (app. 20-26 square metres). 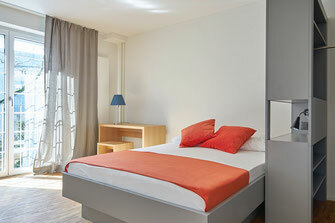 They are especially suitable for those staying with us for a longer period of time. A comfy chair as well as a desk and a multifunctional stool are at your disposal. The bed is 1.40 metres wide. These rooms (app. 18 square metres) are lightflooded and either dispose of room-high windows facing Lutherstrasse or are situated in the corner. 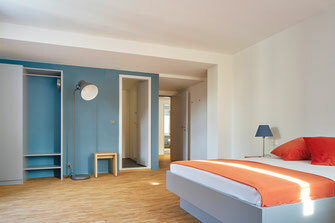 They offer a clever room layout and are suitable for longer stays. A comfy chair as well as a desk and a multifunctional stool are at your disposal. The bed is 1.40 x 2 meters wide. These rooms (app. 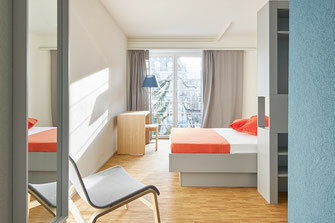 14 square metres) offer a single bed (1.00 metres) and a smart room layout. A comfy chair, a desk and a stool are provided. On your balcony you enjoy fresh air. These rooms (app. 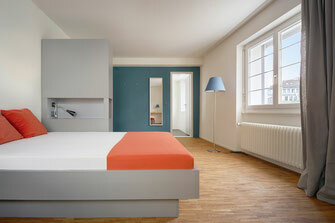 12 square metres) dispose of a single bed (1.00 metres), a comfy chair, desk and stool.